First up, let’s talk about the ingredients you need! 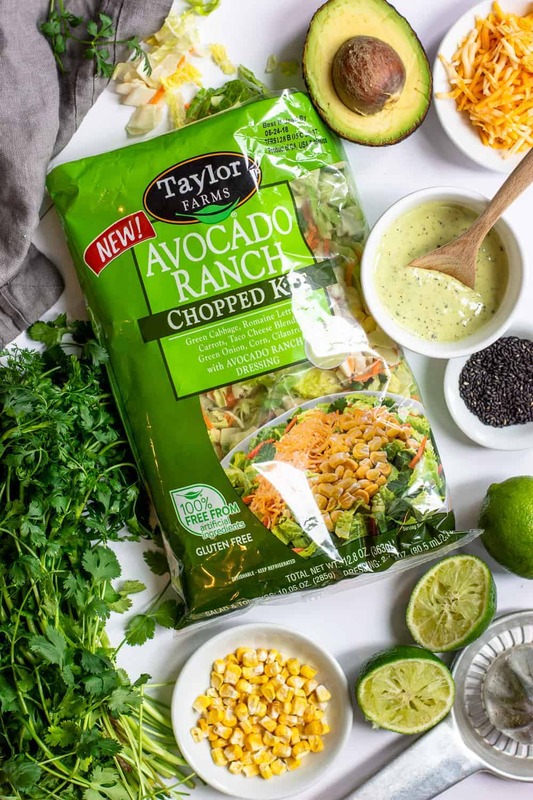 Taylor Farms Avocado Ranch Chopped Salad Kit. This NEW salad just hit shelves and makes salads and bowls so easy and convenient, and I could practically drink the avocado ranch dressing. I love that Taylor Farms creates salad kits that are fresh and encourage the idea that fast food can still be healthy. Can I get an amen?! You can find out where to buy their kits using their store locator here. Also, it’s May is National Salad Month, so you need to make THIS salad in celebration. Sushi grade ahi tuna. We will talk about the importance of this in more detail below! After some quick research, I learned that sushi or sashimi grade tuna simply refers to purchasing ahi that has been prepared in clean facility and kept at the proper temperatures for raw fish. The biggest risk with eating raw fish is bacterial growth, which is a combination of temperature and time it’s been left out, plus the cleanliness of tools used to prepare it. I purchased mine in the sushi department at Wegman’s. You can most likely get it at any specialty or grocery store that has a raw fish or sushi department, or buy it at a fresh fish market. (Pining for the days I lived in Seattle and Pike’s Place was only a drive away!) Bottom line: be smart about where you are getting it, and be sure to use is the SAME DAY you purchase! Where do I even begin?! Eating just 4 ounces of poke (ahi tuna) is 150 calories and 24 grams of protein. 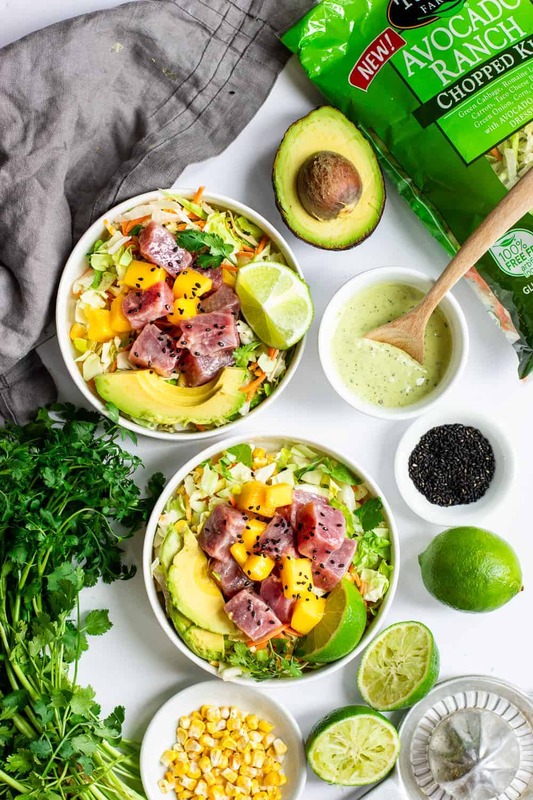 And the avocado ranch chopped salad kit with mango and avocado adds more nutrients and antioxidants, without too many calories. This bowl comes in at 420 calories, and 29 grams of protein. 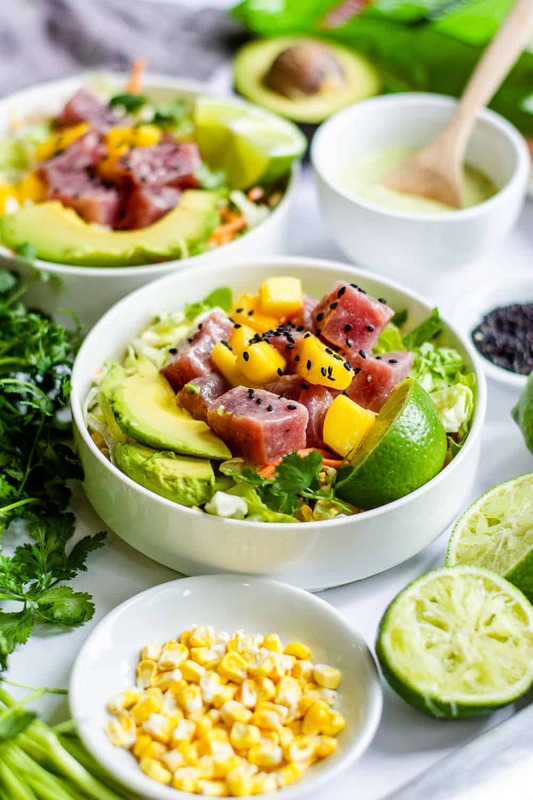 Also, poke is full of Omega 3’s which are linked to good eyesight, brain health (poke bowls make you happy! ), and heart health. Adding in the chopped salad mix, avocado, and mango can help clear your skin, alkalize your body, and improve digestion. 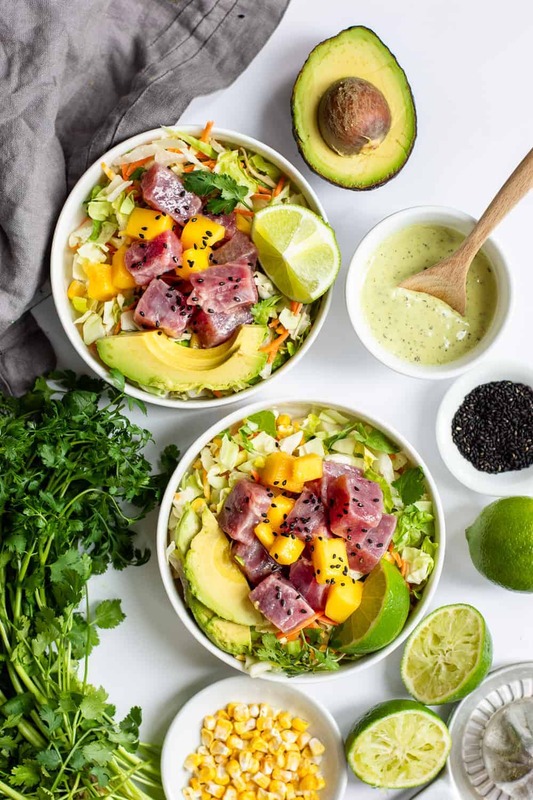 Are you convinced you need this avocado ranch ahi tuna poke bowl with mango yet?! I am. Excuse me while I go dive into a bowl of this deliciousness. 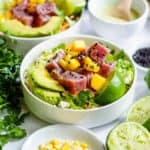 This avocado ranch ahi tuna poke bowl with mango is full of fresh ingredients that are also full of flavor. Make this easy family dinner in under 10 minutes, and enjoy the nutritious health benefits. Chop ahi tuna into small cubes. Mix together avocado oil and lime juice in a bowl. Place ahi tuna and chopped mango in in the juice and mix well. Separate salad in bowls. 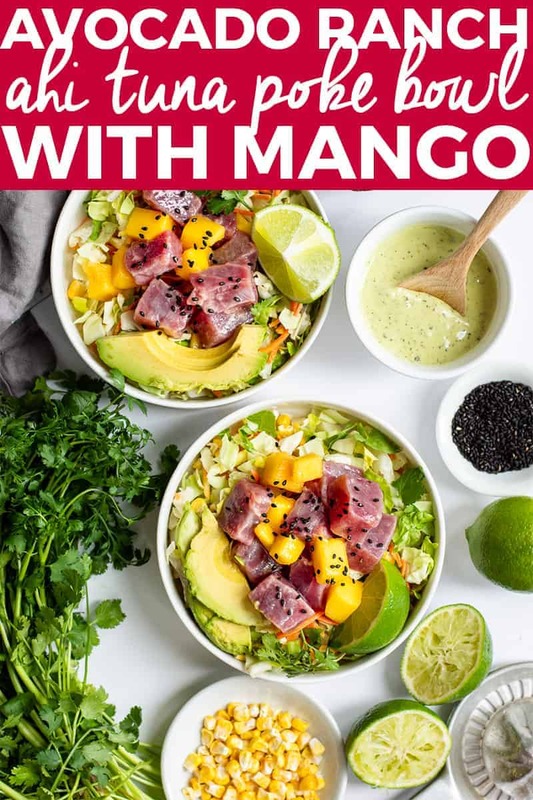 Top with the ahi and mango mixture. Add sliced avocado. Sprinkle with black sesame seeds and the avocado ranch packet. Enjoy! Love this recipe? You’ll love this easy baked frittata with spinach that I made using Taylor Farms mixed greens! It’s an easy and healthy family recipe for a large breakfast or brunch. Click here to get the recipe. This post is sponsored by Taylor Farm, I brand I absolutely love and recommend!